Governor Brown signs Senate Bill 9, directing the State Auditor in the Secretary of State’s Office to conduct a performance audit of state agency practices in disclosing and retaining public records. 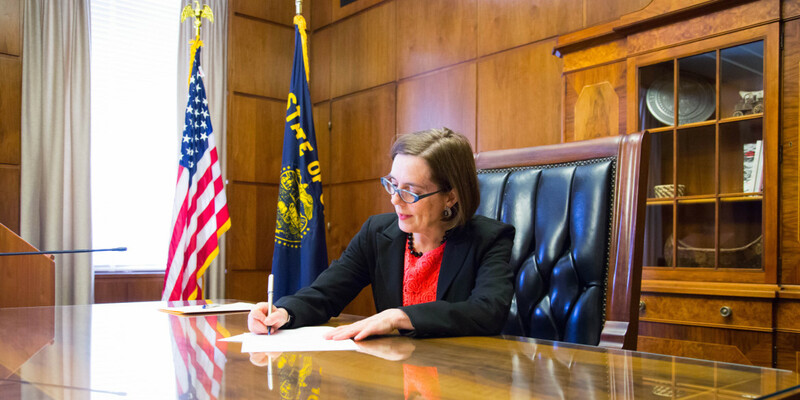 If you haven’t already heard it, Governor Kate Brown’s recent announcement is good news: a pending executive order clarifying how state agencies ought to deal with public records, with emphasis on timeliness and cost. The announcement comes on the heels of an audit from the Secretary of State, which found state agencies in need of ground rules for how to respond to and charge for requests for public records, and a need to adapt to such 20th-century conveniences as email and instant messaging. The audit identified a handful of training and procedural guidelines that could improve compliance and organize records still being thrown into file cabinets and boxes. Brown asked for the audit as part of a broader package on ethics reform earlier this year, saying she needed empirical evidence to improve state agency compliance with Oregon Public Records Law. Though her executive order carries weight only within her own dominion, and she is not yet advocating for reform that would ensnare legislators or local agencies, it’s hard not to see how smart this plan is. It eliminates the usual flap about beleaguered small cities and the legislative inertia that has stalled most every recent policy conversation about transparency in Oregon. And what can transparency naysayers really say about the governor cleaning her own house? Let’s hope the trickle-down theory applies. Brown meanwhile has left Attorney General Ellen Rosenblum’s task force to the messy task of whittling, or at least sorting, the roughly 480 exemptions to the law. She plans to roll out legislation in February to create a neutral agency “to mediate disputes regarding public records between requesters and agencies,” a move the audit also recommended. Models in other states will inform the effort. Oregon fell down on its State Integrity report card for a variety of reasons, many stemming from the collapse of the Kitzhaber administration. But Oregon’s F grade on access to information was not news. The state failed the category this year and in the first such ranking in 2012. The last failure was just less noticed while the state ranked 14th best overall, as opposed to 42nd this year. Though I’m inclined to be a harsh grader in this category, the rankings are not subjective. They’re instead the product of rigorous analysis of whether state law and practice stack up to what the Center for Public Integrity, and its partner on the project, Global Integrity, regard as best practices. Oregon’s lack of firm timelines for response to public record requests, and a lack of standardized costs for requests, have always hurt the state in the analysis, as does its mountain of exemptions to Oregon Public Records Law. That Oregon lacks an independent overseer of public records, the very reform Brown now advocates and many states now have, also affected scoring. But if you look closely, you’ll see that Oregon also ranks poorly on access to open data across the board. In an era when a lot of trends analysis — government or otherwise — is done by computer, it’s important that our retool of how we promote transparency in Oregon recognize the limitations of PDFs and paper. As mentioned in a previous column, Oregon’s present-day interpretation of data access rules stems from an advisory opinion written by the Attorney General’s Office in 1987 — the Dark Ages, as data goes. Yet public records are increasingly stored this way. The City of Portland has had an open data policy since 2009. And eight states in the U.S. have statewide policies on open data. Oregon should have one too. At the very least, the state should position itself to cope with requests for the data it maintains as transparency reform unfolds. State agencies receive an increasing number of requests asking for records in electronic formats such as spreadsheets, delimited data sets, or database files. I should know. I make them. But I find that very few public agencies have the internal skills to respond to such requests. And when they’re routed to people who don’t have those skills, that causes two significant problems Brown aims to address: delays and high costs, incurred while requests are routed through lawyers or to people who develop poorly reasoned, labor-intensive extraction plans. Oregon’s public records law is at least clear in this: it guarantees access to raw machine readable or electronic data. With that in mind, my hope is that when Oregon’s new office is created to mediate disputes over public records, it houses the talent and ability to help state agencies live up to that standard, as well as all the other standards our law supports. Even if an open data law is still ahead in Oregon, we can improve on the practice of delivering data, something that would boost the state’s overall performance on transparency. If you haven’t already seen it, Rosenblum’s staff created a time-lapse video of what it’s like to find these exemptions in state statutes. It’s either hilarious, or sad. I can’t tell. ORS 192.440 (3) provides: “If the public record is maintained in a machine readable or electronic form, the custodian shall provide a copy of the public record in the form requested, if available. If the public record is not available in the form requested, the custodian shall make the public record available in the form in which the custodian maintains the public record.” The “if available” language is confusing — if a record is maintained in a machine readable or electronic form, seems to me it’s available, but that’s a battle for another day. Having this information stored digitally puts it at requesters’ fingertips fast and free. Another great piece of journalism. I wanted to share an anecdote that may help to illustrate to technological lag in some state agencies. Several years ago, I needed to provide supporting documents to the Oregon State Bar regarding a complaint against one of their members, so I burned the files to a mini CD and sent it in a standard business size envelope (it fits just right and there’s no additional postage). I received a reply saying that they didn’t have the equipment to read the type of disc I sent. So I called and asked if they have a computer; then asked if their computer has a CD drive slot; then explained that the smaller circular recess in the CD tray will accommodate the mini CD–so that they actually did have the proper equipment, but they just didn’t know how to use it.